How much will Trump profit from the presidency? It could easily be in the billions. Here’s how. President-elect Donald Trump and former Italian Prime Minister Silvio Berlusconi. Photo illustration by Slate. Photos by Don Emmert/AFP/Getty Images,Sean Gallup/Getty Images. An Italian looking at America’s political present sees uncanny resemblances to his own country’s recent past. In 1994, a cartoonish, orange-faced businessman-turned-politician—one with little experience in politics but a penchant for theatrics—ran for the country’s highest political office. Despite a checkered business history (everything from alleged organized crime ties to tax fraud) as well as a tendency to play fast and loose with facts, he was elected by voters fed up with establishment politicians. 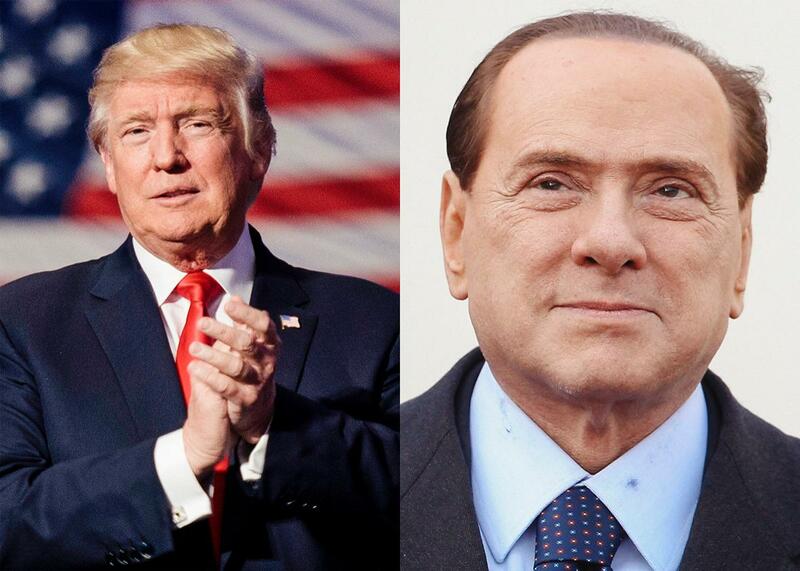 Given the similarities to Donald Trump, it’s no surprise that political observers have turned to Silvio Berlusconi for some hint of what is to come for the United States. And because the Berlusconi chapter in Italian history is now in the rearview mirror, Italian researchers are well into the postmortem of his reign. It isn’t pretty. A careful study of Berlusconi’s TV empire reveals the manifold ways in which companies can curry favor with a politician who doesn’t give up his businesses, as well as the near-impossibility of policing such favor-seeking. The results should further unnerve those concerned about conflicts created by Donald Trump’s business holdings. Italy is one of a number of countries that place minimal restrictions on the business activities of politicians. Thus Giovanni Agnelli, a major shareholder in carmaker Fiat, was able to serve as a lifetime member of the Italian senate until his death in 2003, without divesting his stake in the company. (In Italy, a small number of senators are appointed rather than elected.) Likewise, when Berlusconi ascended to the highest office in the land, he retained ownership over his Mediaset empire, which owned the three TV channels that presented the main alternative to state-run RAI TV stations. The lack of constraints on business interests has its advantages. It may allow Italians to draw on a broad pool of political aspirants, for example. But it also creates obvious conflicts of interest, which is why most countries—the U.S. included—limit the business activities of politicians and bureaucrats. You might not want an auto executive devising regulations on fuel standards or car safety because, consciously or not, he might write the rules to maximize his company’s profits, not the social welfare. Perhaps anticipating that Agnelli would do exactly this, investors drove Fiat’s stock price up by over 3 percent when his lifetime senate appointment was announced. Berlusconi’s election as prime minister presented vastly greater opportunities for self-enrichment than a mere senate appointment. But none of Berlusconi’s electoral victories were surprises, so it’s more difficult to gauge whether investors thought it would add to his companies’ profits. Well before Italians actually cast their ballots, investors would have bid up Mediaset’s price in anticipation of a Berlusconi win. A group of Italian and American scholars looked back on the Berlusconi years for more decisive evidence of corruption. Berlusconi might have tried to benefit his own companies directly by, say, ensuring that they received lucrative government contracts or favorable legislation. But that would have been easy fodder for Italian journalists and perhaps a bit too much for the country’s voters. But as the study’s authors point out, politicians also have less direct—and less detectable—methods at their disposal. They suggest, in particular, that a politician might be able to elicit benefits from companies controlled by others with the presumption (though not necessarily the explicit promise) that the favor will be returned. It’s what the study calls “indirect lobbying,” to distinguish it from the more immediate and more readily observable methods that companies and other interest groups exploit to influence government, like traditional lobbying and campaign finance. Favors from businesses to politicians are most easily accomplished when the politician is himself in business, since favor-seeking businesses can, say, buy goods or services from the politician’s company at inflated prices (or sell to them at a discount). This is why we have laws as well as norms that keep politicians out of business entirely (or at least those businesses they might oversee in their roles in government). But Italy’s weak laws of divestiture allowed Berlusconi to remain the dominant shareholder in Mediaset throughout his time in office. (The firm was headed by one of his children. This should again be sounding familiar to an American audience.) The TV business, it turns out, was particularly suited to indirect lobbying, allowing companies to curry favor with Berlusconi by overpaying for ads on his network. Berlusconi came into and out of office three times during the 1993–2009 period that the researchers focus on. Using sector-level advertising expenditures from Nielsen (the same company that provides TV show ratings here in the U.S.) for both Mediaset and its competitor RAI, the study shows that, after accounting for factors like audience share and sector, Mediaset’s share of ad spending was about 2.3 percent higher in the years that Berlusconi was in office. While this may not sound like much, when multiplied by the billions spent on advertising during Berlusconi’s nine years in power, it adds up to over a billion euros in extra Mediaset profits. The extra revenues weren’t the result of airing more ads—Mediaset stations devoted the same fraction of airtime to advertising regardless of who was in office. Rather, companies paid consistently higher prices for Mediaset ads when Berlusconi was in office. RAI, meanwhile, was forced to cut prices when Berlusconi was in power, so the net effect on ad spending was to shift revenues from the public coffers (recall that RAI is a state-owned broadcaster) into Berlusconi’s pockets. And Mediaset couldn’t justify the higher prices because consumers switched their television allegiances—audience shares of Mediaset and RAI held steady across the whole 1993–2009 period. Further bolstering the indirect lobbying interpretation, the advertising effect comes entirely from highly regulated sectors (like telecommunications, pharmaceuticals, and construction) whose profits are most easily affected by government action, rather than loosely regulated ones (toiletries, toys, apparel). That Berlusconi may have profited to the tune of a billion euros from serving as prime minister is particularly galling given that part of his pitch to voters was that he was already so wealthy that he would be immune to corruption. Trump fed the same line to disenchanted voters. But as the paper emphasizes, the richer the politician (or, more to the point, the more extensive his business interests), the greater the potential for him to profit from holding office. All of this should be troubling for Americans, especially given the businesses President-elect Trump happens to be in. Ads on Mediaset are a boutique product. While it’s now clear, thanks to the clever work of the authors of this study, that advertisers overpaid for Mediaset airtime during Berlusconi’s terms in office, at the time, it was very difficult to detect, as there was no ready benchmark for the product. Similarly, how are we to know whether companies are overpaying to license the Trump name to hawk their condos? Or for a night at the Trump International in Washington, D.C.? It’s difficult to assess, via stock market responses, whether Donald Trump’s victory is likely to be a source of ill-gotten profits. Trump’s main ventures are privately held, so there is no stock price to gauge investor’s intuitions. The value of some of his business partners’ firms have shot up in value—for example, his Indonesian partner in a hotel venture saw its stock price increase 23 percent on news of the election outcome. But given the particular business Trump is in, it’s hard to know what to make of this. Trump’s name is now imbued with much greater prestige than it was before Nov. 8. People may be willing to pay more for a Trump-branded condo or hotel room in New Delhi or Washington, D.C., even if they aren’t attempting to curry favor with him. But just as in Berlusconi’s Italy, corporations with business before his administration will have ample opportunity to indirectly lobby the president through his complicated web of business interests. Trump made it abundantly clear in Wednesday’s news conference that he has no intention of unraveling this tangle of conflicts. As his lawyer explained, divesting himself of ownership could expose Trump to “unreasonable losses.” This makes it all the more likely that political office will prove to be just as profitable for Trump as it was for his fellow tycoon-politician in Rome.